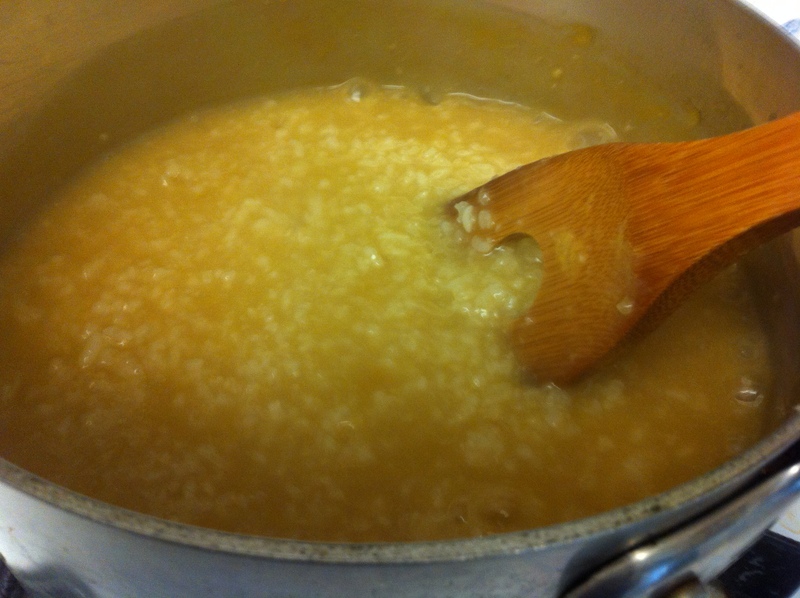 Koreans eat porridge when they are sick because it is easy to digest and full of nutrition. I woke up with one of the worst headaches and sore throat a few days ago. The last thing I wanted to do was to cook so I just ordered in. The only problem was that I couldn’t eat anything I ordered and just felt more nauseous. So the next day, I decided to make an easy juk (죽, porridge) with ingredients I already had at home. You can make juk with anything vegetables, meats, or leftover soups. Technically you are supposed to make juk with uncooked rice that has been soaking in water for at least an hour or two, but I often make it with already cooked rice which is a faster and easier way. 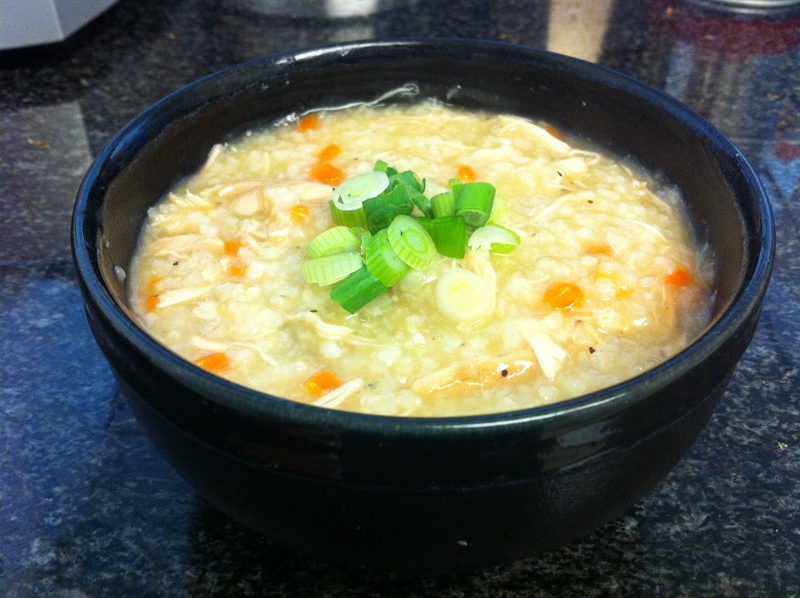 Since I introduced how to make juk with already cooked rice and leftover soup in my earlier post about miyuk-juk, I will show you how to make dalk-juk or chicken juk with uncooked soaked rice. This recipe cuts corners and simplifies the dish by using chicken stock and leftover roasted chicken instead of the traditional way of stuffing a chicken with sticky rice and cooking it from scratch. Rinse the rice several times and soak it for at least 2 hours. I soaked in overnight in the refrigerator so I could cook it in the morning. If you have a food processor or a blender, pulse the drained rice a few times. You can skip this step if you like. 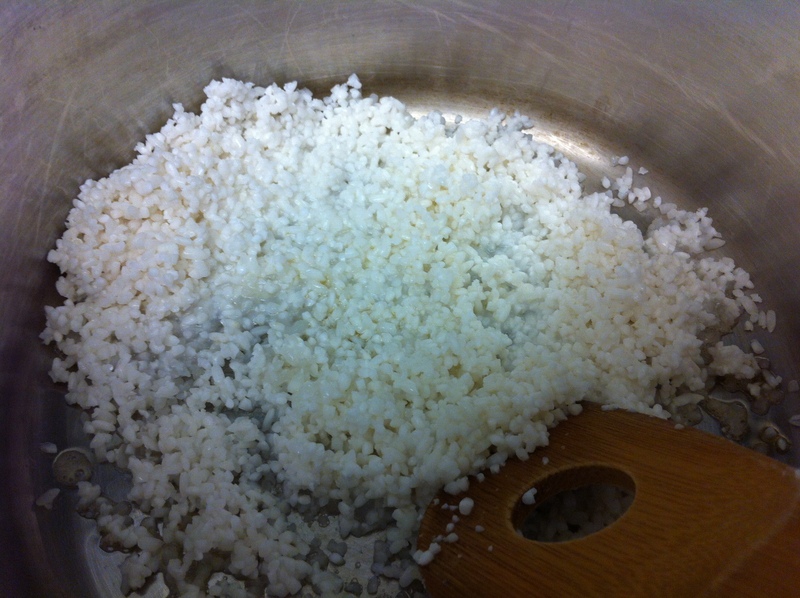 In a medium size pot on medium-high heat, drizzle a little sesame oil and sauté the rice for about 2-3 minutes. 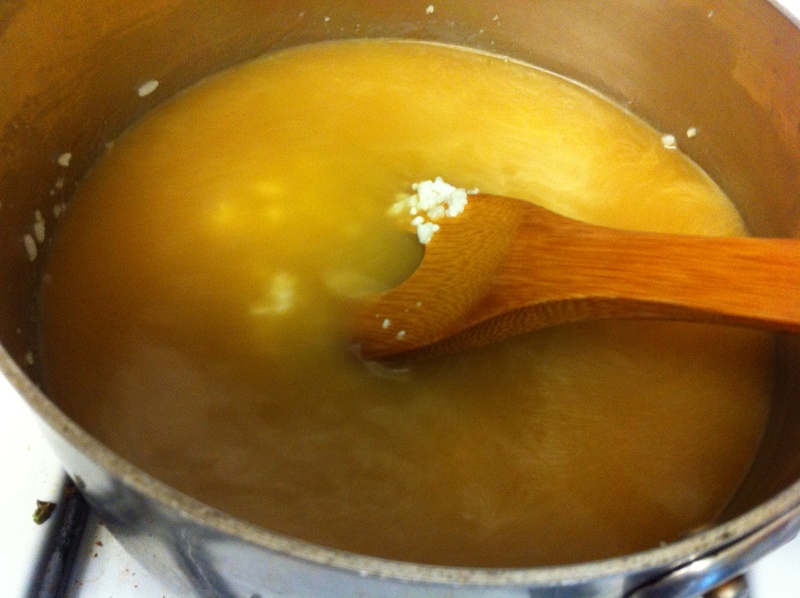 Pour in the chicken stock or broth and stir. Bring it to a boil on high heat and lower the heat to medium-high to let it simmer. Stir often so the rice does not stick on the bottom. 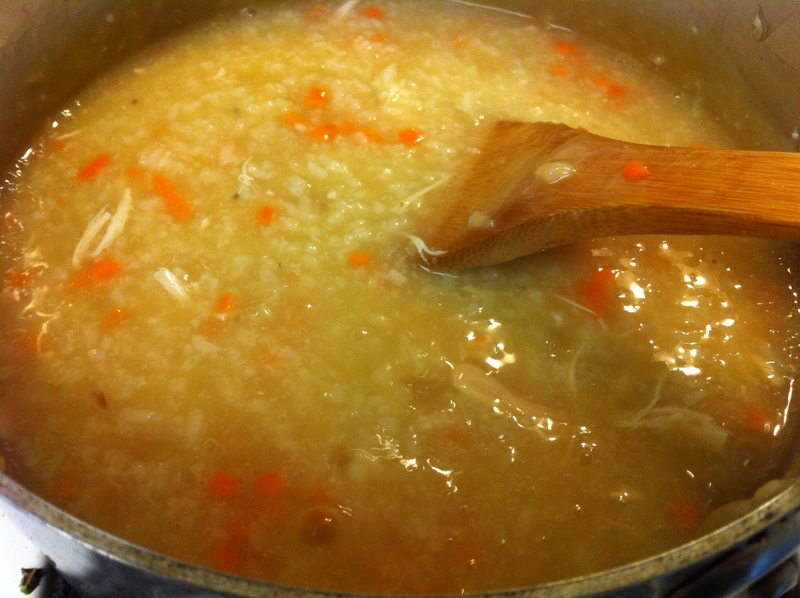 Cooking juk is almost like making risotto except that you don’t have to pour the liquid a ladle at a time. After about 15 minutes, add the finely chopped carrot and garlic. You can substitute other vegetables as well. A great option is to use Korean chives, boochu (부추). Cook for about another 10-15 minutes until the juk is a consistency of a hot cereal or oatmeal. Stir in the scallions if you did not use boochu. Garnish with toasted sesame seeds. 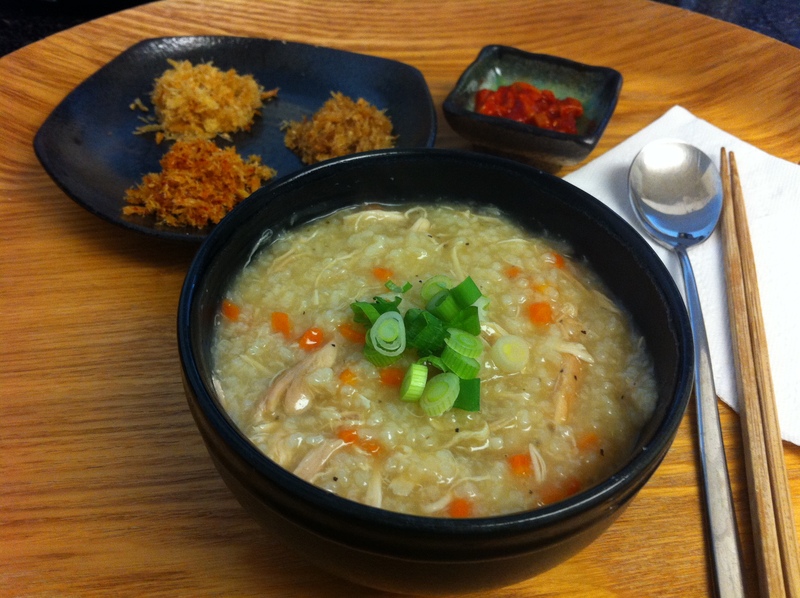 This entry was posted in Good for breakfast, Good for dinner, Good for lunch, Meat/Chicken, Rice Dish and tagged Chicken, Juk by gangnamkitchen. Bookmark the permalink.